Can’t wait to get to Painters Greenhouse! 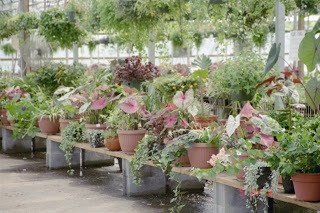 We received great news to share with green thumbed gardeners and plant novices alike: Painters Greenhouse in Old Fort is now open for the season! This is one of our favorite local growers to visit for their wide variety of super healthy shrubs, perenniels, bedding plants, houseplants and more. In fact, we got all the water plants that grace our solarium fishpond from Painters Greenhouse last year. Open House (March 28-29): Browse the spring plants at this celebration event, complete with free refreshments and entertainment. 5th Annual Herb Festival (April 11-12): You can be sure that Brigette will be visiting Painters Greenhouse for this festival, just in time for adding great herbs to the Inn on Mill Creek herb garden. Mother’s Day and Bedding Plant Sale (May 6-17): We guarantee you’ll be able to find plenty of flowering and vegetable bedding plants during this sale, plus some of the most beautiful hanging baskets we’ve seen. Painters really does a creative job with their hanging baskets and planters. It’s very tempting to buy more than what can fit in your car. There’s a lot more going on at Painters Greenhouse during the growing season. Check their website at www.paintersgreenhouse.com and click on Current Ads for information. They also have driving directions available on their website. Plus, their photos link is worth browsing if you need a little bit of green garden cheer during this last part of winter. This entry was posted in Uncategorized and tagged flora and fauna, Old Fort / Andrews Geyser by Inn on Mill Creek. Bookmark the permalink. Thank you so much for the write up! Please look me up next time you come in. If you have some brochures on your place,please bring me some; I get inquires occasionally about lodging.